Only surviving son of Henry VII. Born 1491. The most married king of England. In the year of his accession married, by Papal dispensation, Catherine of Aragon, his deceased brother Arthur's wife. Crowned at Westminster, June 24th, 1509. Received the title of Defender of the Faith, 1521, and styled Head of the Church ten years later. Divorced Queen Catherine, May 23rd, 1533, and married Anne Boleyn, who was crowned Queen the month following. Catherine died at Kimbolton in 1536. Queen Anne Boleyn, on whose character he had stamped the infamy of adultery, if not a worse crime, was executed, and the King three days after (May 20th, 1536) married the Lady Jane Seymour, who died in childbed, 1537. Three years later he married Anne of Cleves, whom he divorced in little more than six months; whereupon he married Catherine Howard, his fifth wife. Two years later she was sent to the block, and in 1543 he married his sixth wife, Catherine Parr. It is said that he dressed himself in white on the day of Anne Boleyn's execution, to display his contempt for her, little divining that her child would be known in history as the most famous of his House, and one of the greatest of Queens the world has ever known. 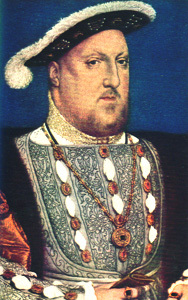 The Reformation, and the dissolution of the monasteries, its natural outcome, is to be reckoned the most notable event of Henry VIII. 's reign, abiding in its consequences. The most famous statesman of the times was Cardinal Wolsey, the King's Chancellor and most able and trusted first Minister of State; son of a wealthy townsman of Ipswich, memorials of whom remain to our time Christ Church, Oxford, Hampton Court Palace, and in that well-known London thoroughfare Whitehall, the site in part of York House, his principal palace. "Haughty beyond comparison,". In raising his clerical favourite (ambitious, it was said, to become Pope) to the head in Church and State, King Henry "gathered all religious as all civil authority into his personal grasp." Wolsey's downfall came. "There was never legate or cardinal that did good to England," said the Duke of Suffolk, when Wolsey's doom was sealed by the wrath of his master in the business of Queen Catherine's divorce. Wolsey died in 1530. Henry henceforth had to think and act without him. The ten years that followed were among the most momentous in English history. "The one great institution which could still offer resistance to the royal will was struck down." That institution was the Church in England and Henry himself became its "Supreme Head." Thus came the formation, under the inspiration (for so it is recorded) of Thomas Cromwell, able Secretary of the Cardinal, and after his death Henry's Prime Minister, whose fall was as sudden as Wolsey's.